January | 2012 | Save the Kales! I’ve worked around books for nearly half my life, and they’ve been important to me for all of it. I still remember that trip to New Hope, PA (doesn’t that just sound like a place where magical things happen?). It was 2002 or 2003, walking through the new/used book shop on Main Street, making my way to the “Our Staff Recommends” shelves, the most sought-after part of any bookstore. This is where you exchange ideas with the living, breathing employees of a store, where a few sentences on a rectangle card could give you insight about the story and the person who read it. And that’s when I first saw that striking cover, graphic black and white, jarring in it’s contrast, and the text in swooping handwritten cursive. This, before handwritten font became the norm (not that I’m complaining; I think a good handwritten font is one of the most intimate forms of design). 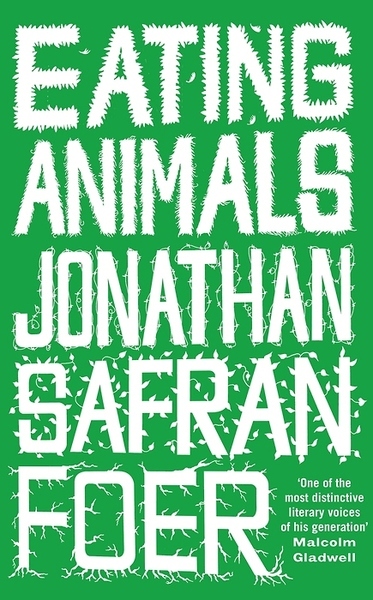 It’s easy for me to say that Jonathan Safran Foer is one of my favorite authors. Usually “What/Who is your favorite?” questions conjure anxiety, followed by the complete wiping out of any thoughts or ideas on the topic, and I’m left to stare blankly and shrug in response. But with Jonathan Safran Foer, it’s easy. 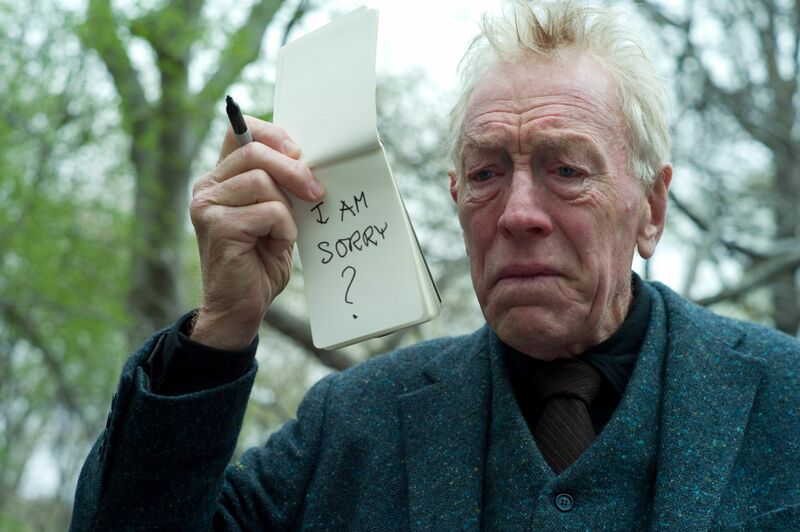 I think part of why I respect him as a writer is not not only his use of metaphor, or the way he uses the actual placement of text on a page to help tell the story, but because he as a human being seems like a good person. Those are small words for a big idea. But it is evident in his writing, the subjects he writes about, and the sincerity with which he writes. I’d love if he could be my real-life friend, but I’m still pleased to call him a favorite author. Except the thing with that book is that I have started and re-started to read it nearly ten times in the last six or seven years, and I can’t get through it. It feels too real, perhaps especially so for anyone who lost their father at a (relatively) young age. For the same reason, and those mentioned above, I’m not sure I can see the movie either (yet). But I am getting over the fact that “the masses” will now become familiar with Jonathan’s work. Now, when I go to work at the bookstore and I see a sixteen year old girl with Twilight under one arm and Extremely Loud under the other, I hope that Jonathan’s book will mean something special to her. I truly believe the ideas put forth in the books that mean the most to us create our values, help us to see the world through different lenses, and can impact our lives and who we are more than we can measure. 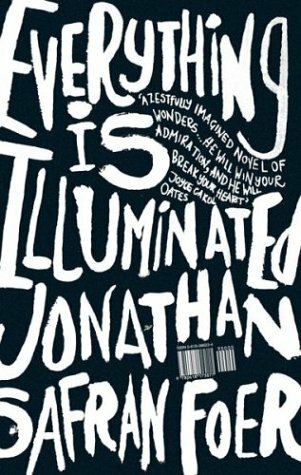 I’m happy that someone as talented and thoughtful as Jonathan Safran Foer is getting the chance to effect more people with his beautiful work. HOW DOES THIS RELATE TO SAVE THE KALES? This is how: In 2009, Jonathan wrote a nonfiction book called Eating Animals. It is, as you can imagine, about his journey to vegetarianism. What prompted him to take a look at his food choices and the environmental impact of them was for the same reason many people decide to make life improvements: he was going to have his first child. What’s remarkable about this book is that, unlike most books on the topic, it is very narrative in style. And it also comes from the point of a view of a regular person learning about this stuff for the first time. He isn’t a vegan, he hasn’t ever been involved with an animal rights organizations and doesn’t have years of information and hard-formed opinions. He is a guy who cares about the world in which his child will grow up, and what he will use to nourish his child, and finds that modern food politics are pretty messed up. A few times in my life I’ve been asked about how I will raise my own children. I remember meeting the conservative Christian Italian family of my boyfriend in freshman year of college, piling spaghetti with marinara sauce on my plate, and his mother slamming down the bowl of meatballs right in front of me and saying, “Well if you ever have kids, you better not make them eat this way, I don’t want my grandkids to be malnourished“. Friends and family have asked in inquisitive, non-confrontational ways if I would raise my child, a baby, on a vegan diet. There is a part in Eating Animals addressing this topic that so perfectly sums up my own thoughts and feelings – especially feelings, food and how we raise our children are both very emotional things. While I recommend the whole book, and any of his work, this part in particular does just the thing good books are made for: they help us to understand ourselves better. “Children confront us with our paradoxes and dishonesty, and we are exposed. You need to find an answer for every why — Why do we do this? Why don’t we do that? — and often there isn’t a good one. So you say, simply, because. Or you tell a story that you know isn’t true. And whether or not your face reddens, you blush. The shame of parenthood — which is a good shame — is that we want our children to be more whole than we are, to have satisfactory answers. My children not only inspired me to reconsider what kind of eating animal I would be, but also shamed me into reconsideration. …. You can read a longer excerpt of the book, including these paragraphs in context, on the NY Times website here. I’ve been busy. Like BUSY busy busy, the kind when you take time off to hang out with your friends and feel guilty about it (ew!) or you, uh… are a cook but don’t cook anything for a week. A girl cannot be sustained on tofurkey sandwiches alone. 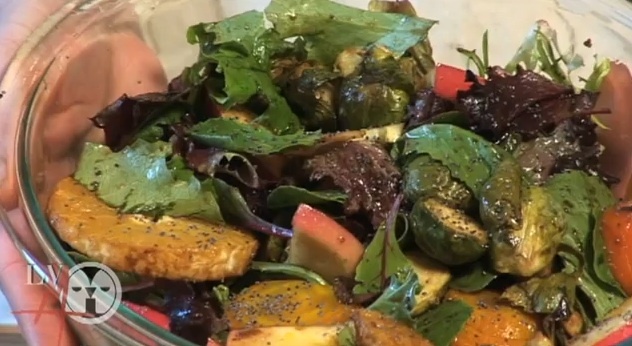 I wanted to make a hearty, super-healthy salad with roasted veggies for that cozy wintertime taste, but some bright accents in flavor and color. So I whipped up this salad and a light crisp dressing. Perhaps not the most creative (“put a bunch of things in a bowl and toss!”), but what it lacks there it makes up for in prettiness. Tasty, too. In an oven heated to 350 degrees, wrap the whole unpeeled beets in tin foil and place on an oven rack. While they are cooking, cut brussels sprouts in half and toss with just enough olive oil to coat lightly, fresh ginger and the juice of 1/2 an orange. Spray a baking sheet with cooking spray and put brussels sprouts on the sheet. Add to the oven (with the beet package) for about 25-30 minutes. After that time has passed, remove everything from the oven and set aside to cool. In a small pan, add the balsamic vinegar, brown sugar, ginger and juice of one orange to a pan and turn on a low heat. The vinegar should let off some steam. Stir occasionally. Reduction will be thicker after 15-20 minutes. Take off heat and allow to cool in a bowl. Cut the peeled orange into rounds. Cut the apple into bite size pieces. Open the tin foil package. Beets should be cool enough to handle. The skin should easily peel off. Slice into rounds. In a large mixing bowl, add a few handfuls of salad greens, all the vegetables and fruit, and the balsamic dressing. Toss with your hands to coat everything lightly. Use the 1/2 an orange you have left and squeeze on top just before serving. Sprinkle with poppy seeds. As I mention, you can toss some leftover grains into the salad to bulk it up a little. Have some cooked brown rice or quinoa? Toss it in. Thank you to Lehigh Valley Mirror, as always, and especially this time around for coming over for a morning shoot when I was bumping into everything, fumbling around, almost chopping off my fingers and breaking into sudden bursts of uncontrollable laughter. You do an AMAZING job with editing! If we’ve ever met in real life, even just for a few minutes, I’ve probably talked about a few things: how delicious broccoli is when roasted; how do shar pei’s get so many wrinkles? ; how much I love Sundays and why brunch is the best meal of the week. Today I’m happy to tell you that the last part is happening, back with a vengeance. If you live in the Lehigh Valley, you must know who Chef Wendy is. If you don’t, pay attention. Go get a pen and paper and write this down. 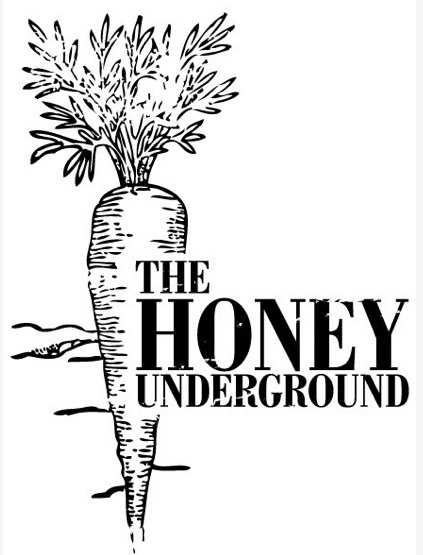 Wendy is owner and executive chef of Balasia/The Honey Underground. The former used to be a brick and mortar business (in a fancy old victorian house in Emmaus, PA), and now shows up at every farmer’s market in the Valley to provide us with tasty lunches and take-home food. The latter is a supper club – a hip pseudo-restaurant that sets up on weekends in a firehall that gets transformed into a calming, candle-lit sit down eatery. Well, we can all joins hands across America because Wendy is bringing back the best meal, on the best day. I can clearly only be talking about one thing: SUNDAY BRUNCH. Sunday brunch was actually how I became familiar with Wendy and her food. A few years ago, we would wait all week for Sunday to approach so we could go to Balasia (then in Emmaus), sip coffees and organic juices and sparkling waters. Order meals that were so beautiful in presentation, the first time I saw one of Wendy’s dishes I exclaimed, “I feel like I’m eating a sculpture, a work of art”. Everything vegan, organic, local as often as possible… it was a meal to be savored, eaten slowly and shared by passing full forks across the table. It was so fun to bring out of town friends there, and even they would say things like, “I wish there was a place like this Brooklyn”. 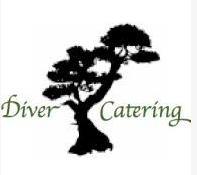 And let’s not forget to mention another culinary superstar on the scene who will also be a part of this meal, Misi from Diver Catering. 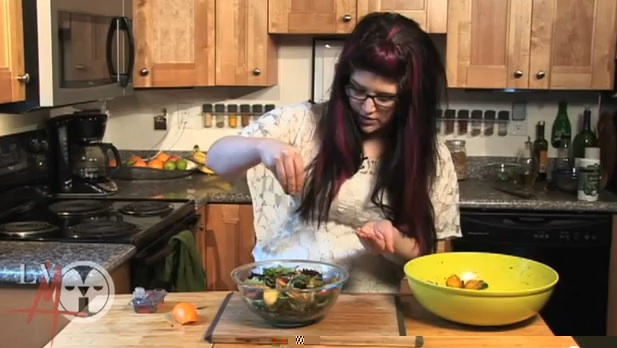 She will make a fool of anyone who thinks vegan sushi is boring, flavorless or unappetizing. You can hire Misi for special orders and occasions, and also find her at the Steelstacks Farmers Market which is (new and!) every Saturday from Noon-4pm. Once again, proof that food can be, and most definitely is, art. This upcoming brunch is a one-time event, though hopefully enough interest will mean more and more could happen in the future. I hope to see you there! 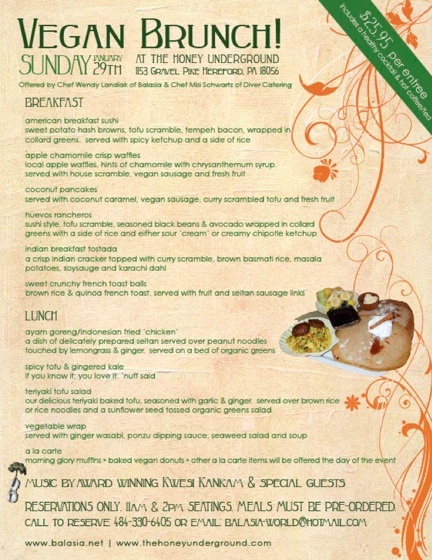 You can view a detailed menu on the FACEBOOK event page. My appologies for lack of recipe posts, or posts in general this week. Between house-sitting and picking up some hours temping for an arts/music organization (I’m learning office skills! ), I have barely gone grocery shopping let alone done much cooking. Ryan is in Utah for a work trip at a faux-Scandanavian resort, and I’ve been visiting family and finding excuses to try food at different establishments. So, by “barely” grocery shopping, I mean I haven’t. It’s becoming a dire situation. Yesterday I ate half of a plain roll for breakfast. Woopsies. I’m going today and I promise content-heavy posts will come soon. 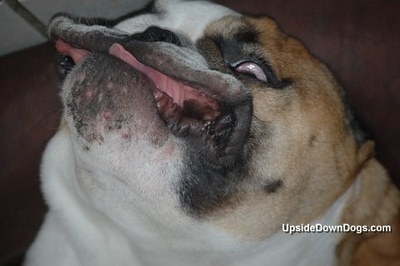 UNTIL THEN… I wanted to share with you one of my FAVORITE “I’m having a tough day and need some cheering up” websites. Or just a “I want to laugh and squeal with utter glee” websites. Or whatever. You need to go here. And if you have a dog, submit something. Or just send the photos to me. 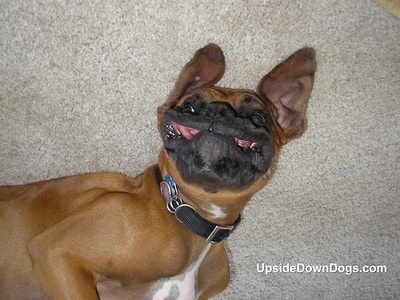 I give you… UPSIDE DOWN DOGS. I just had a heart attack and died. 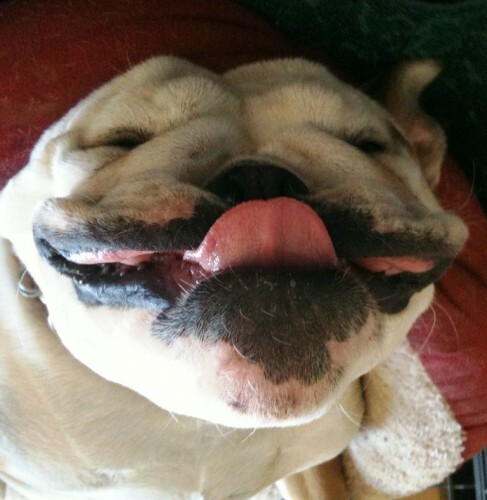 A blob of dog with a tongue sticking out. There are HUNDREDS OF THESE PHOTOS. 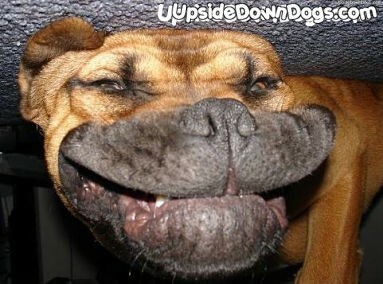 Check out UpsideDownDogs.com … You’re welcome. At the end of a day of marathon antiquing with my friend Tesh, we decided to stop by The Trapp Door for dinner and drinks. I hadn’t been there since it got new ownership (formerly “Tap and Table”), and Tesh hadn’t been there at all. Plus, bless her heart, she’s the best antiquing friend because she restrains me from buying every modern chair and she earned a drink that day. 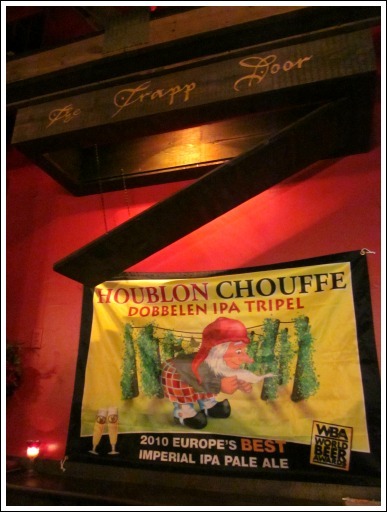 Don’t be fooled by the unassuming exterior of the The Trapp Door. 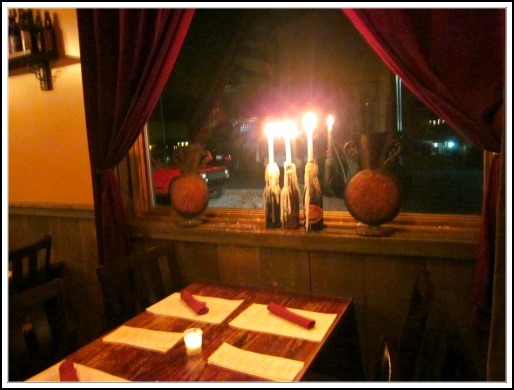 Inside it’s a rustic and spacious room with vaulted wood ceilings and the warm glow of candles. 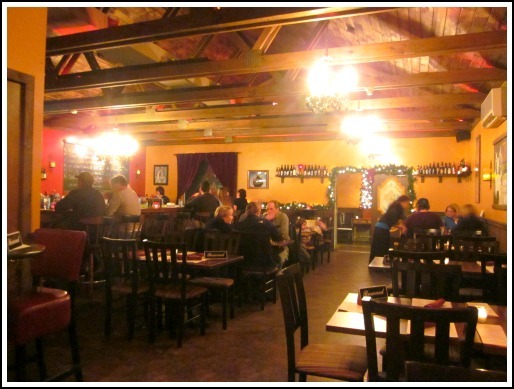 Though the space is large and open, the atmosphere is cozy. The decor modest but full of texture making it feel like the opposite of a typical college bar with neon Miller Lite signs. A bar made of copper, the specials on a a huge chalkboard menu, that ceiling of wooden planks, and dark velvet curtains… it feels upscale without being stuffy. It’s still accessible. You can go in jeans and take in the live (quite good) music or turn it into a fancy date. The food menu is updated seasonally, and has something for everyone. I ordered a coconut peanut vermicelli and vegetable dish, with a sweet creamy sauce and lots of perfectly cooked veggies. When Tesh and I finished eating our main courses, we noticed some guys a few seats down had ordered the fries and they looked so good, so we got those as well to share. The Pomme Frites (ooh lala) were crispy on the outside and soft in the middle, and came with a tangy house-made ketchup, garlic herb mustard and *spiced black honey (not vegan). It’s exactly the sort of place you’ll want to spend as much time as possible in during these cold Pennsylvania nights. The staff is extremely friendly, I feel food and drink prices are fair, and the atmosphere is one of the best I’ve had the pleasure to take in. For many years, I assumed the only thing a slow cooker was good for was pot roast and maybe a few potatoes and carrots. Don’t be fooled! If you don’t currently use a slow cooker, you can pick one up for a great price and experience for yourself how nice it is to go to bed with the components of a meal, then wake up to a cooked meal. As if kitchen elves sneak in at night and make a wholesome dinner while you’re sleeping. Thankfully for us, there are many plant-based recipes online if you still have trouble thinking of using a slow cooker to make grains, veggies and beans. Several books are on the market too, and that’s where this recipe comes from. 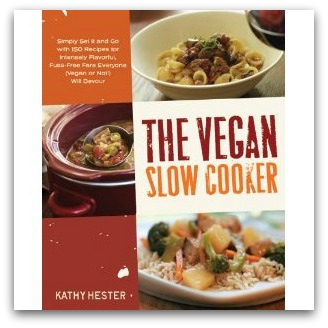 The Vegan Slow Cooker by Kathy Hester is packed with 150 healthful – and creative – recipes. 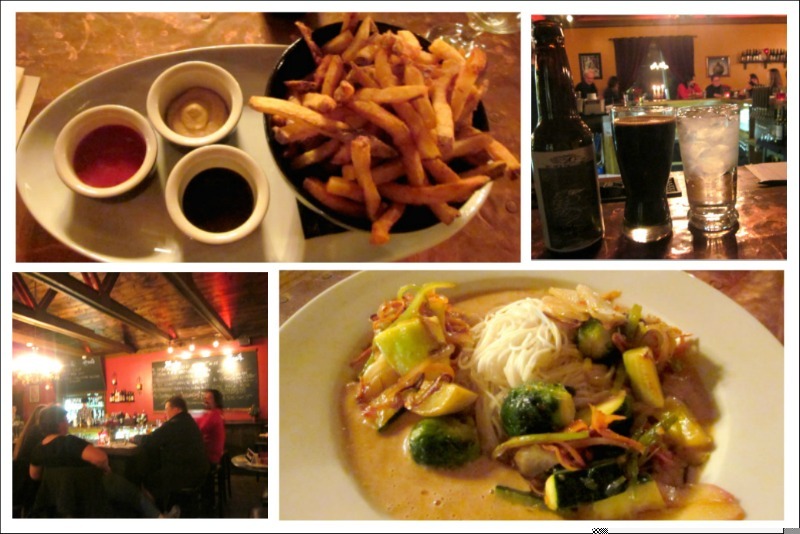 Marmalade, brownies, pumpkin ginger bread, tofu red curry, etc… YUM. This recipe is straight from the book (with the addition of extra chili powder, and some smoked paprika). This is great served over rice or a grain of choice. Heat the oil in a pan and sautee onions until translucent, 3-5 minutes. Add garlic and sautee another 2 minutes. Mix water with dried spices in a bowl. 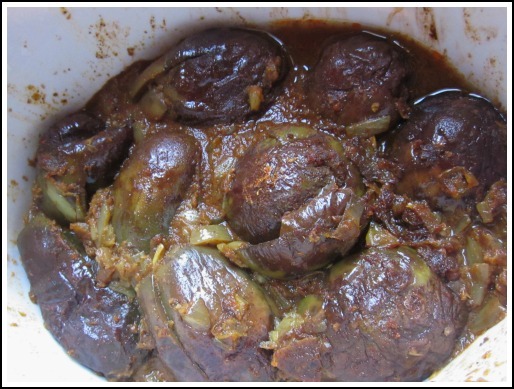 Combine the onion, garlic, ginger, spice mixture and eggplant and transfer to an airtight container. Put in the fridge overnight. 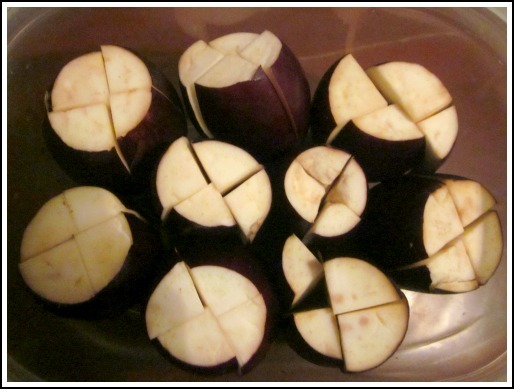 Cut "x"'s through the baby eggplant, halfway down the length. 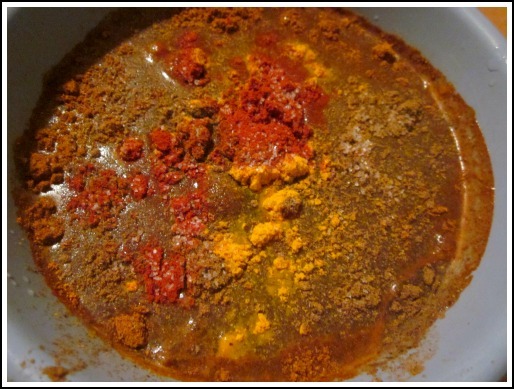 Mix curry spice mixture with water. 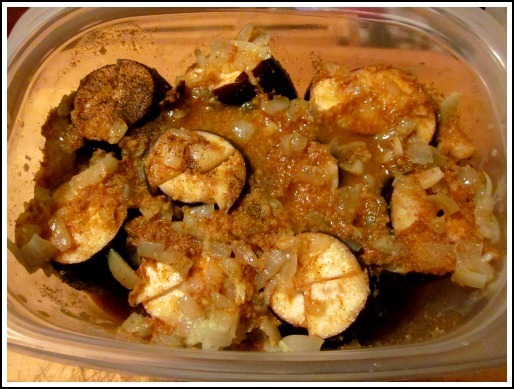 Pour sauteed aromatics and spice mixture over eggplant. Store in the fridge. Spray the insides of the slow cooker with cooking spray. Add all ingredients to the slow cooker, cover with the lid, and turn on “low” for 6-8 hours. When finished, eggplant will be soft. 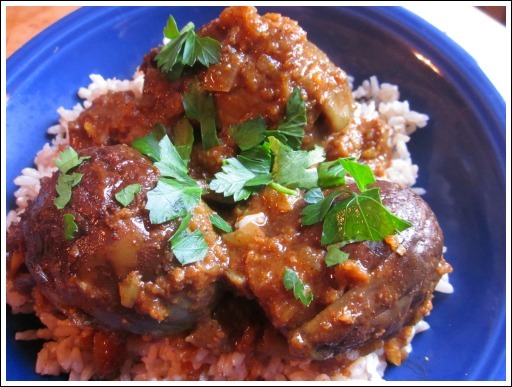 Transfer eggplant to slow cooker. Eggplant is finished in 6-8 hours and will be soft. Garnish with some cilantro or parsley for color. DONE! 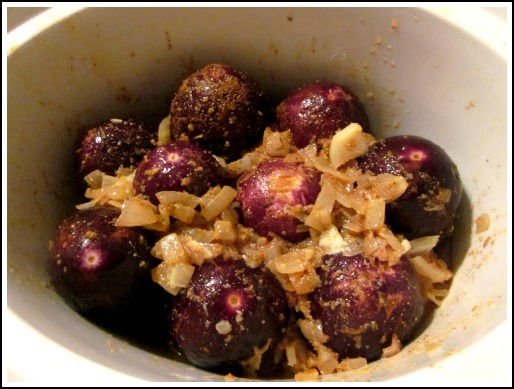 This would be great with a chutney or served alongside a coconut soup or bean salad. If you don’t have a slow cooker, do yourself a favor and pick one up! Ask friends or family if they have one they don’t use… I’m surprised to find that many people have one (or more) in their basement or in the back of a cabinet where it never gets used. Oh, and a little extra info: A “Slow Cooker” and a “Crock Pot” are the same thing. Crock Pot is actually a company that makes slow cookers, and people use the terms interchangeably, just as you may call a tissue a “Kleenex” or a copy of a paper a “Xerox”.